One of Palmer's most well known buildings on State Street was the Palmer House. In 1871 Potter Palmer married Bertha Honoré and built her the Palmer House as a wedding gift. The hotel opened on September 26, 1871 and burned in the Great Chicago Fire thirteen days later. Palmer proceeded to rebuild the Palmer House choosing to make the hotel grander than it had been and advertising it as "The World's Only Fire Proof Hotel". The Palmer House Hotel opened again in 1875. Potter Palmer continued developing areas in Chicago including Lake Shore Drive on which he built his famous Palmer Mansion. Palmer continued to be involved in real estate in Chicago and was an active promoter of the Chicago World's Fair. Palmer died in 1902 at the age of 75. In the 1920s downtown Chicago had outgrown the Palmer House. The Palmer Estate chose to rebuild the hotel, increasing the size to a 25-story hotel. The Palmer House was bought by Conrad Hilton in the 1940s and became known as the Palmer House Hilton. The hotel is still open, and is currently known as Palmer House - A Hilton Hotel and happens to be the second-largest hotel in Chicago. 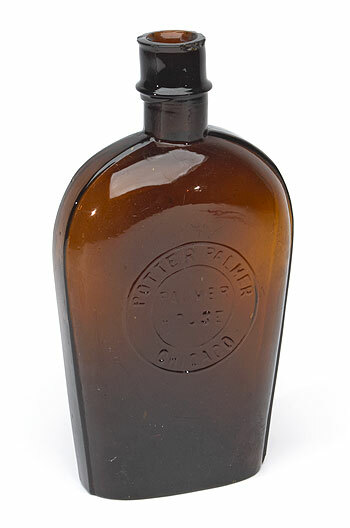 This bottle was offered in our Select Auction 135, May 30 - June 8, 2016.